Healthy Families~Family Farms continues to raise money to purchase ‘seconds’ or ‘ugly’ fruits and veggies from local farmers and then donates that food to food banks. Local farmers benefit from the additional income (because farming is so labor intensive, this monetary incentive encourage the harvesting of seconds) and food bank recipients benefit because they receive fresh, healthy nutritious produce. Since2004, Healthy Families ~ Family Farms has donated over 872,000 pounds of produce to food banks. As of 7/1/15, GYO participants have harvested 3,144 pounds of fresh, healthy fruits and vegetables. 1068 pounds has been shared with 553 people outside of the program! We are also refurbishing a garden at Girls Inc., in Bristol VA which will provide healthy food for families in need and partnering with VHS special needs students to prep garden boxes for a fall vegetable garden at Bristol Redevelopment and Housing Authority, Bristol VA.
Garden Box Project continues to serve small households and people with physical limitations with more than 85 garden boxes currently in use in our region. 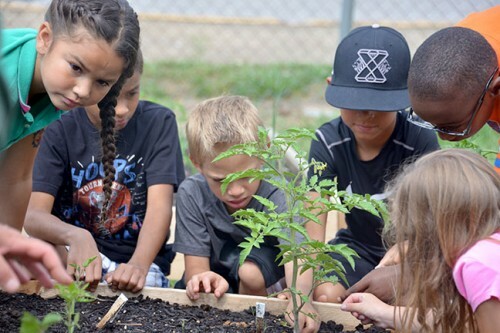 Second year funding has been secured and planning is well under way for year 2 gardens at Haynesfield Elementary School in Bristol, TN and Sullins Academy in Bristol, VA. First year gardens are going strong at Boys & Girls Club of the Mountain Empire in Bristol, VA and new installations for the fall of 2015 have just been approved for Cornerstone Christian Academy in Abingdon, VA and Boys & Girls Club of Greater Kingsport. Many of the garden projects share a goal to increase access to fresh, healthy food. Then each program can identify additional goals and action steps like: cooking demos, nutrition education and culinary training. Appalachian Sustainable Development is dedicated to its mission to grow food, communities and opportunities to build a thriving Appalachia. ASD serves Buchanan, Dickenson, Lee, Russell, Scott, Smyth, Tazewell, Washington, and Wise counties in southwest Virginia and Green, Hamblen, Hancock, Hawkins, Sullivan, and Washington counties in northeast Tennessee. ASD operates 10 programs in 3 sectors: sustainable agriculture/food system development, sustainable forestry/wood products and food access. For more information please visit www.asdevelop.org or visit facebook.